Chip lovers looking for a little kick from their bags of Lay’s or Miss Vickie’s jalapeño-flavored kettle chips could get more than they bargained for if they don’t check the package, as Frito-Lay has recalled several sized packages of the chips over concerns they could be contaminated with Salmonella. Frito-Lay announced the voluntary recall of the jalapeño-flavored kettle cooked chips after learning of the possible presence of salmonella in the chips’ seasoning. According to a notice posted with the Food and Drug Administration, it learned of the possible contamination from a supplier who recently recalled a seasoning blend that included jalapeño powder. So far there have been no reported illnesses related to the recalled products. Affected products were distributed to retail stores and vending machines across the U.S. Specifically, the recall covers all sizes of Jalapeño Flavored Lay’s Kettle Cooked potato chips and Jalapeño Flavored Miss Vickie’s Kettle Cooked with a “guaranteed fresh” date of JUL 4. 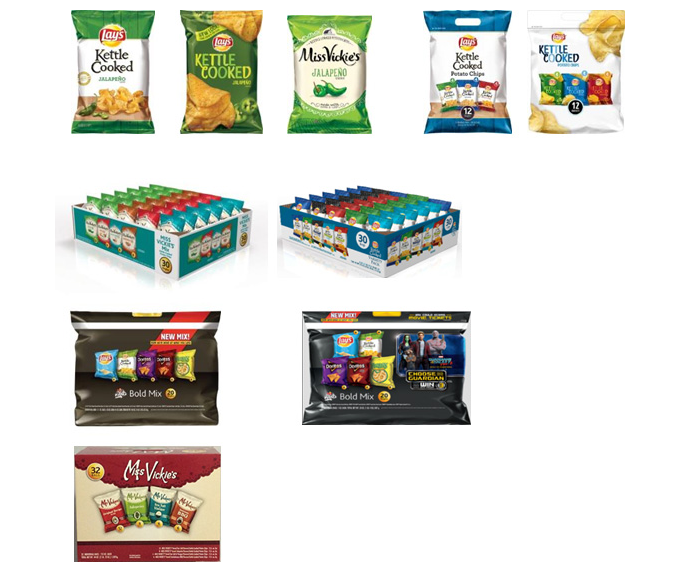 The recall also covers multipack bags of chips that have a “use by” date of JUN 20 or prior printed on the multipack package, and a “guaranteed fresh” date of JUL 4 or prior printed on the front panel of the individual bags. Frito-Lay notes that other flavors contained in the multipacks, as well as Jalapeño Cheddar Flavored Lay’s Kettle Cooked 40% Less Fat potato chips, are not affected by the recall. Consumers who have purchased the recalled chips are advised not to eat them. For product reimbursement, purchasers can visit wwww.jalapenochiprecall.com. Next Why Do Larger Clothes For Women Often Fit So Badly? Next Up: Why Do Larger Clothes For Women Often Fit So Badly?